Samsung galaxy Tab 3 comes with a 7 inch TFT LCD display with a resolution of 1200 x 600 pixels thus giving you a pixel density of 170 ppi. This display resolution is similar to that of Samsung Galaxy Tab 2. This tablet is powered by 1.2 GHz dual core processor which is backed by 1 GB RAM. it has an internal storage memory of 8/16 GB extendable using microSD card. The chipset of this device is thus almost similar to TAB 2 only difference being that it has a 1 GHz dual core processor. The Android version has been upgraded to 4.1 jelly bean. This device has a primary camera of 3 MP and a secondary camera of 1.3 MP. Connectivity features include 3G HSPA+, Wi-Fi,Wi-Fi channel bonding, Wi-Fi direct, Bluetooth 3.0 and GPS. The battery capacity is also similar to Galaxy Tab 2 at 4000 mAh. Samsung Galaxy Tab 3 8.0 has a 8 inch display with slightly higher resolution of 1280 x 800 pixels,(180 ppi)though with the increase in display size, the difference in the clarity will be further reduced. It comes with Android 4.1 jelly bean O.S. and is powered by a 1.5 GH z dual core processor and a RAM capacity of 1 GB. This tab comes with 16 GB Internal storage memory which is further extendable using a microSD card. Samsung Galaxy Tab 3 7.0 shows no significant improvement over Samsung Galaxy Tab 2, and the later is priced almost 3 thousand more at 17,745 INR.where as the 8 inch variant is almost similar to Note 8 . Samsung Galaxy Note 8 comes with Wi-fI and 3G will cost you 25,725 INR which seems somewhat justified pricing. 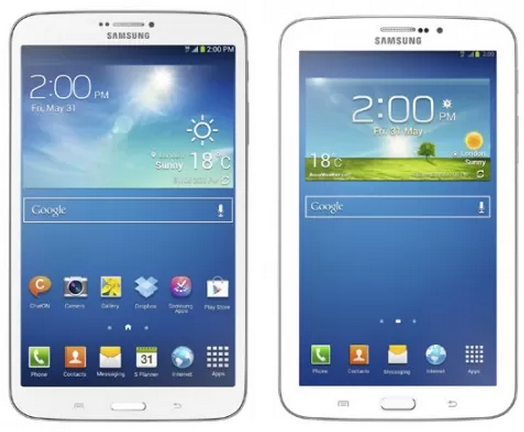 Samsung Galaxy Tab 3 with Wi-Fi and Without 3G is available for 21, 945 INR.